I've taken the plunge. I've invested in the latest big-ticket consumer product, a high-definition television. I first saw HD way back in 1987, I think it was. In New York City on TCS business, Jack Sedlak and I visited our former co-worker Ann Crago, whose new company was promoting the new format. The company was called "1125," because that was the number of lines of resolution in the current Japanese version of the technology. 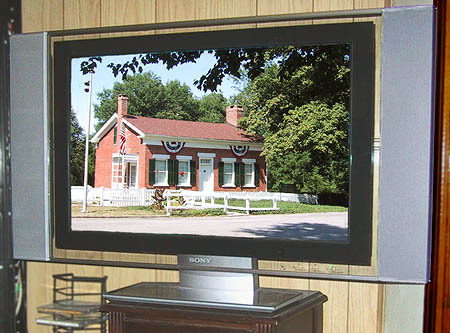 Ever since then, video enthusiasts have been looking forward to the arrival of high-def in American homes. Finally, in August of 2003, it made it to my apartment. Comcast Cable began offering HD channels. All I lacked was an HD set to receive them. Sixteen years seemed long enough to wait for such a set; so even though they're still rather expensive, I went out and bought one. My choice was a 30" Sony LCD model, one of the smaller HD sets in size (although certainly not in price). It fit my needs. I live alone, so I don't need a huge screen. If I park myself on the couch directly in front of this one, it's just big enough. Also, because there's no one to help me move the furniture, I appreciated the fact that this display weighs only 44 pounds. The picture is outstanding. On the eight high-def cable channels that I receive, there are programs I might otherwise pass by, but I find myself watching them just because they look so good. I sometimes limit my channel surfing to just those eight. I work in TV control rooms, where there's not just one big screen but a wall full of them, each showing the viewpoint of a different camera or tape machine or other source. One learns to multitask, keeping one's eyes moving about the monitor wall. At home, my "wall" is a five-foot-high steel shelving unit, placed just to the left of the big HD screen. From my couch, I can see it all. Usually I don't try to follow this many different programs, however. Typically I put three programs on the three small screens and choose one of them to be displayed on the big screen with its stereo speakers. I'm proud of this setup. Here's how the rack is laid out. The incoming cable includes about 70 analog channels and 70 digital channels. It's amplified and distributed to four different devices. One of these devices is the "Media Receiver Unit" (1) that controls the big screen and selects which picture will appear there. 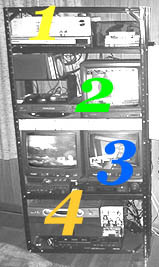 The others are a pair of videocassette recorders (2) and (3) designated as Green and Blue, and the cable box (4) provided by Comcast. The MRU has two analog tuners of its own, so it can display one or two channels on the big screen, even without the help of the other devices below it. Those other devices each have their own video inputs to the MRU, which can switch any of them to the big screen as well. 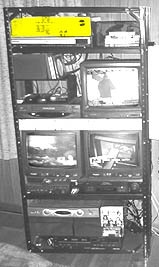 Two of those devices are VHS VCRs, each of which feeds an adjacent 13" TV for monitoring purposes. I generally leave the closed captioning "on" for these smaller screens, but keep the big screen uncluttered by turning captioning "off." Incidentally, the white horizontal strip of paper between the two VCRs is merely a listing of the cable channels available. I use these VCRs to record programs and/or play them back. In surfing mode, I can use their tuners to flip through the analog cable channels. If I find something interesting, the MRU can put it onto the big screen so that I can hear the audio. Or, on the rare occasions when I want to hear audio from two programs at once, I can turn up the speaker on a 13" monitor as well. The Motorola cable box has two video outputs, standard NTSC and component. The standard signal feeds the third 13" monitor. 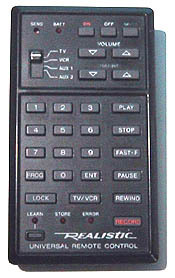 It also goes to one of the audio-video inputs of the Blue VCR so that digital cable channels can be recorded. The component signal (which will be high-def if the box has been tuned to a high-def channel) goes up to the MRU, which can then send it to the big screen if desired. 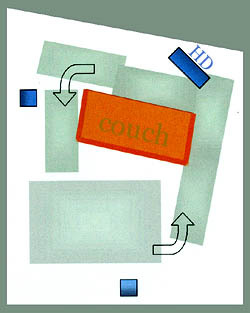 The MRU has a second component input, from the DVD player located immediately below it. This DVD doesn't have its own 13" monitor, but its picture can be viewed on the Green monitor if desired. Because the DVD player sometimes is used for playing audio CDs, its audio output is also fed to the AM/FM receiver near the bottom of the rack, which drives a separate pair of bookshelf speakers (one shown here, the other off to the right). There are a few unusual operating modes that require reconnecting cables in new combinations. 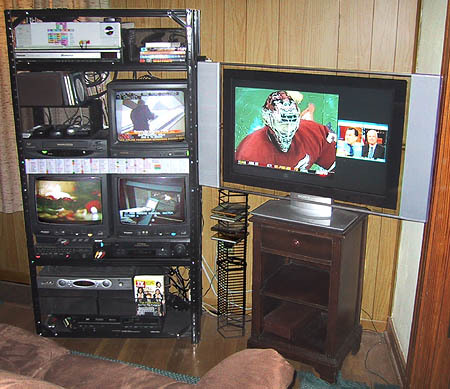 For example, if I want to record a Steelers football game with the TV audio on one channel and the radio play-by-play on the other, I have to repatch three RCA plugs. Rather than juggle half a dozen remote controls, I've programmed a venerable Radio Shack "learning" remote to operate the commonly-used functions of everything. For example, suppose I'm channel surfing. Buttons 1 and 2 change the channel on the MRU. 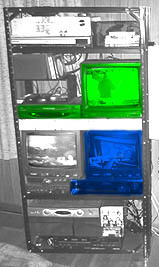 Below them, buttons 4 and 5 change the channel on the Green VCR. Below them, buttons 7 and 8 change the channel on the Blue VCR. 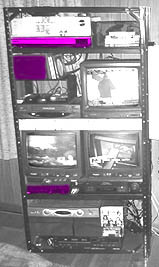 Below them, three more buttons change the channel on the cable box, and the "TV/VCR" button cycles through the various sources on the MRU. One pair of buttons changes the volume on the big screen, while the pair next to it changes the volume on the Green monitor. When the MRU switches a program to the big screen, it also makes the same program available as a standard-definition video and audio output. I modulate that signal onto RF channel 3 and send it to three more TVs. Two of them are 13" sets elsewhere in the room, and the third is a smaller set in the kitchen. This means that I'm not necessarily tied down to the couch in front of the big screen. I can move around and still watch the program. In my trapezoidal living room, I've arranged the furniture and rugs so that I can pace circles around the room, ten seconds per lap. The two additional 13" sets, shown here in blue, are strategically placed so that I don't miss anything if my back is to the HD set. When the weather's not good for walking outside, I try to get my exercise by circling this room for half an hour at a time. But if there's a high-def picture on the big screen, it's hard to tear myself away from the couch. Of course, there's always room for improvement. Sometime in the next couple of years, I may upgrade my system with surround sound. I may gradually replace the VHS tapes with a hard-disk Personal Video Recorder and a DVD recorder. As of 2004, however, I'm just enjoying the options I have now  especially high definition. Update: The DVD recorder has arrived, along with a home-built routing switcher to select one of its inputs. See my 2005 article on How I Switch TV, and also my 2018 post.